OPI- meep meep meep notd | S J M W E L L - Fashion, Beauty & Lifestyle blog. This was one of the polishes I picked up in a recent 'haul'. If you want to see swatches of the other one's I picked up, I posted here! I was trying to find a 'dupe' for OPI's let me entertain you and this is preety close to it, I'd say it's a tiny bit darker and the glitter is a bit bigger which you can't really see in the photo, it was hard to try and get a photo of it, but there are plenty of online swatches where you can see the glitter. This photo was actually taken after I've had it on for 5-6 day's, I only have a slight chip on one or two nail's which I blame to me doing some diy's. I used a new top coat from OPI which is also in the haul and wow, I don't think a polish has ever lasted so long. 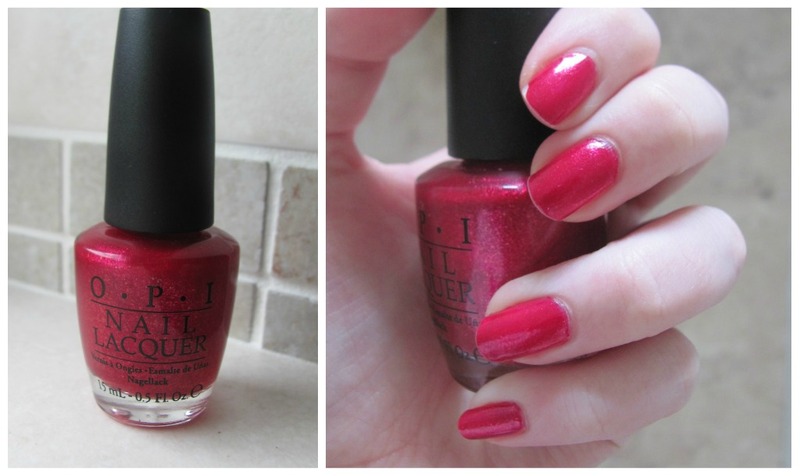 This is such an interesting post, I've just posted a bad review of OPI, how strange! I love the colour though, so festive. the colour of your polish is divine!